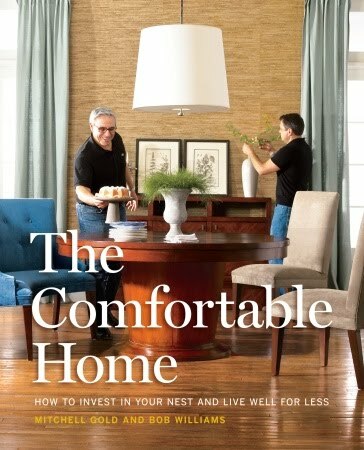 I can't get enough of the new book, The Comfortable Home: How to Invest in Your Nest and Live Well for Less, from accomplished design duo Mitchell Gold and Bob Williams. Sometimes it feels impossible to recreate the spaces you see in many interior design books. We've all been there. But this guidebook is practical and makes the design process seem so manageable. There are solutions for every area of your home, from the entry to the bedroom. The spaces featured are all stylish, have a clean feel, and really are inviting. Best of all--they are about comfort, which is key for me. I also appreciate their smart use of color in spaces. Nothing's worse than going overboard with any one color in a room. I especially love that it endorses a decorating approach that involves making good use of pieces you already own. How can you not love that? It can be overwhelming to think that your furniture just doesn't add up to what's featured in these kind of design books, so I found this refreshing. The Comfortable Home truly is all about design for the times. Thanks to publisher Clarkson-Potter for sending it my way.